Nogale’s Women’s Club – Fashion Show! 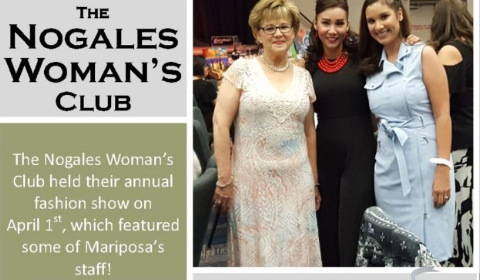 The Nogales Woman’s Club held their annual fashion show on April 1st, which featured some of Mariposa’s staff! Great job to Conchita Somoza, Valeria Arballo & Cindy Giles! There were a total of 45 models representing different businesses in the community. Funds raised from this event help support many community projects such as the Scholarship Program, Reading is Fundamental, Domestic Violence Shelter, Girl Scouts and others.